If you have had a positive pregnancy test, we recommend that you access maternity care as soon as possible via your GP or Community Midwife, who will complete the necessary referral into maternity services. Early access to maternity care is important to ensure that all the appropriate care options are discussed, including all antenatal screening options. This is really important for you and your baby’s health. To find out who your local Community Midwifery Team are, you can ring (0161) 276 6246 – Manchester University NHS Foundation Trust Radio Telephone Room. Your midwife will be able to complete a referral to Saint Mary’s Hospital. Your GP can refer you directly to Saint Mary’s Hospital or advise you to see the Community Midwife for referral to Saint Mary’s Hospital. Depending on your postcode, you will be offered a booking appointment, usually within two weeks, with either your local community midwife (employed by this Trust) or at one of Saint Mary’s Antenatal Clinics, which includes clinics at Saint Mary’s, Trafford General Hospital or Salford Royal Foundation Trust Hospital. Who will look after me during my pregnancy? If you are booked for midwifery led care, your care will be provided by a midwife, usually your community midwife. Occasionally you may be asked to attend a hospital antenatal appointment where you will be seen by the hospital team. If you have any existing medical conditions or if we identify any issues, then you will be referred to a hospital for review by the medical team. You might be seen at hospital once or you might need to attend regularly depending on your individual needs. The doctor who sees you will make a plan of care for your pregnancy, and you may be able to receive some of your care closer to home, as this is usually more convenient for you. You can be confident that you will receive care from professionals with the expertise to support you through your pregnancy. At your booking appointment, you will be given your handheld maternity records. This is where all the information about your care in pregnancy will be recorded. You should look after this booklet carefully and always carry it with you so that important medical information is always immediately available to any health care provider. In particular, always make sure you take it to every antenatal appointment. The information in your handheld maternity record is confidential, so you might want to store it securely at home. You may also be given the Department of Health Pregnancy Book. Click here to view a copy. Many women are able to choose where they receive their antenatal care. For most women this will be at a location close to their home by their community midwife. Some women with existing medical conditions will have most, or in some cases all, their care at a hospital antenatal clinic. These are located at Saint Mary’s, Salford Royal and Trafford General Hospitals. You can find out more about the antenatal clinics for women with particular medical problems within the sidebar content to the right of this page. Antenatal clinics operate between 8.30 am and 4.30 pm. Please make sure that you attend on time for your clinic appointments. Parking on the hospital sites can take time so please make sure you allow yourself plenty of time to park your car and walk to the clinic. If you are going to be late, or you need to change your appointment, please ring (0161) 276 6409. If you are late, we will do our best to accommodate you on the same day, but other patients who have arrived on time will be seen first. On arrival at the clinic, please book in at the reception desk so that we know you have arrived and get your medical notes ready. At some of your appointments, you will also need to have a scan on the same day and the scan time should be before the clinic appointment. If you also have a scan, please still report to the antenatal reception desk first. After your scan please return to the antenatal reception and let them know you have returned from your scan. Please ensure that you always bring your handheld maternity notes, and also a sample of urine to EVERY clinic appointment. Click here to get more information on how to collect a urine sample. At the end of every clinic appointment, the doctor or midwife that you have seen should ensure that any future appointments have been made. The time and dates of these will be written on the back of your handheld notes. After you have seen the doctor or midwife, please call back to the reception desk to make sure that all these appointments have been booked. The MFT Community Midwifery Team is made up of six teams. You will be informed by your community midwife of the date and times of your local community based antenatal clinic. Saint Mary’s Hospital – (0161) 276 6409. Salford – (0161) 206 5307 or (0161) 206 5308. Trafford – (0161) 746 2026. 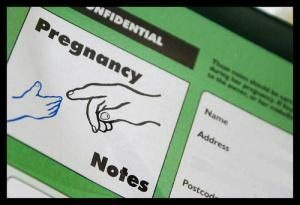 All the contact telephone numbers that you might need during pregnancy are on the front page of your handheld notes. How often will I be seen during pregnancy? Your occupation and maternity benefits. Ultrasound and blood tests offered in pregnancy. Plans will be made for the best care package for you in pregnancy. She will also measure your height, and weight, check your blood pressure and test your urine. You will be given your handheld maternity record at this appointment which you keep throughout the pregnancy and you should carry them with you at all times. You may also be given the Department of Health’s Pregnancy Book. You should have your first dating scan, and screening for Down’s syndrome if requested. At this appointment, all the results of blood tests taken earlier in pregnancy should be available and reviewed. Your blood pressure and urine will be checked, if indicated, your midwife may suggest an iron supplement. At this appointment you will have a structural scan of the baby to check for any physical problems. You should also see a midwife around this time for measurement of your blood pressure and urine. Although the scan will be at the hospital, the appointment with the midwife may be in the community. If this is your first baby, the midwife will see you to check your blood pressure and urine, and also measure the size of your baby with a tape measure over your bump. Women having second or subsequent babies do not need this appointment. The midwife will see you to check your blood pressure and urine, and also measure the size of your baby with a tape measure over your bump. If your blood type is Rhesus negative, you will be offered an anti-D injection at this stage. The midwife will see you to check your blood pressure and urine, and also measure the size of your baby with a tape measure over your bump. Your midwife will see you to check your blood pressure and urine, and also measure the size of your baby with a tape measure over your bump. You will also discuss the birth and how to prepare for labour, including your birth plan if you wish. If you have had a healthy pregnancy, then birth will usually be planned on the Midwifery Led Care Unit and we will make sure you have the correct telephone numbers to ring. You will also get information about feeding and caring for your baby, vitamin K and screening tests for newborn babies, the baby blues and postnatal depression. Your midwife will see you to check your blood pressure and urine, and also measure the size of your baby with a tape measure over your bump. Your midwife will also start to discuss options available if the pregnancy lasts more than 41 weeks. If this is your first baby, the midwife will see you to check your blood pressure and urine, and also measure the size of your baby with a tape measure over your bump. Women having second or subsequent babies do not need this appointment. Your midwife will also discuss options available if the pregnancy lasts more than 41 weeks. Your midwife will see you to check your blood pressure and urine, and also measure the size of your baby with a tape measure over your bump. The options for induction of labour, including a membrane sweep should also be discussed. Most women will gain around 10-12 kg (22-28 pounds) during pregnancy, due to the growth of the baby but also due to increasing fat stores to provide energy for breast feeding later on. The midwife will ask to weigh you and measure your height at your first visit. This is so your body mass index (BMI) can be calculated. We know that women with a high BMI are at increased risk of complications during pregnancy, so by calculating your BMI we can make sure you get the right care to try to reduce risks where possible. For most women, we will not routinely ask to weigh you again during the pregnancy. Make sure that you always take a urine sample with you every time you visit the midwife or doctor. Your midwife should give you a pot for this. Every time you see the midwife you will be asked provide a sample of urine. At your first visit, this will be sent off to the laboratory to screen for infection. At each visit the midwife will test the urine for the presence of protein, sugar or signs of infection. These can all be signs that further tests might be needed. For advice on how to collect your urine for testing click here. Your midwife or doctor will ask to take your blood pressure regularly throughout pregnancy. This is because high blood pressure can be a sign of problems developing. It is very common for blood pressure in healthy women to fall during pregnancy. This is not dangerous or a problem, but sometimes makes women feel lightheaded. If you are worried about this, discuss it when you next see your midwife. Anaemia means that you have low levels of the molecule that carries oxygen (haemoglobin) in your blood. It is very common, and it can arise for many different reasons. It is usually because you are short of iron. Iron is the nutrient that the body uses to make haemoglobin. You will be routinely offered a blood test for anaemia when you first book with your midwife and also later in pregnancy at 26-28 weeks. If you are anaemic it can make you feel overly tired. You may be advised to take iron supplements during pregnancy. It is important to take this as advised so that you can be as healthy as possible for your baby. Sometimes iron tablets can upset your stomach and be difficult to tolerate. If this happens, please discuss this with your midwife or doctor as there are alternative options. All women are offered a test of their blood group. This is so that if you were to bleed heavily when your baby is born, the hospital have a record of your blood group so that a blood transfusion, if needed, is safer. The blood group also tests for special antibodies in the blood that can occasionally pass to the baby and, rarely, make the baby unwell. The commonest of these antibodies are called Rhesus antibodies. Women who are Rhesus negative but have a baby who is Rhesus positive (which can occur if the father is Rhesus positive) may make antibodies against the baby’s cells. These women will be offered an injection called Anti-D to reduce the chances of this happening. Sickle cell anaemia and thalassaemia are inherited disorders that can cause anaemia. All women booking to deliver their baby at Saint Mary’s will be offered screening for these disorders with a blood test. If you are found to be a carrier of the disorder, your partner will also be offered a test as parents who are both carriers have a 1 in 4 chance of having a baby with serious anaemia. You will be offered screening blood tests to see whether you have had these infectious diseases in the past. This is because these infections can cause complications in the pregnancy and it is useful to know at the beginning of the pregnancy if you have been exposed or not. This scan is performed usually between 8 and 14 weeks to check your baby’s heartbeat, the number of babies and to calculate when your baby is due. If there is a problem seen on the scan your doctor will explain this to you. This scan is performed usually between 18 weeks and 20 weeks plus 6 days to check whether your baby is developing normally or whether it has any obvious abnormality. If there is a problem seen on the scan your doctor will explain this to you. More information about ultrasounds scans in pregnancy can be found in the scan section of the website. What other tests are available? Down’s syndrome is a chromosomal disorder that affects around 1 in 1000 pregnancies and happens when the baby inherits an extra copy of chromosome 21. Children with Down’s syndrome have learning problems and sometimes other complications. All women are offered the option of screening for Down’s, Edwards’ and Patau’s syndrome. Most babies with Edwards’ or Patau’s syndrome have a wide range of problems which are usually extremely serious. Most will die before they are born or shortly after birth. Edwards’ syndrome is a chromosomal disorder that affects around 3 in 10,000 births and happens when the baby inherits an extra copy of chromosome 18. Children with Edwards’ syndrome can have unusual head and facial features, growth problems and be unable to stand or walk. Patau’s syndrome is a chromosomal disorder that affects around 2 in 10,000 births and happens when the baby inherits an extra copy of chromosome 13. Children with Patau’s syndrome can have a cleft lip, growth problems poorly formed eyes and ears, problem with their kidneys and be unable to stand or walk. This is offered early in pregnancy between 11 weeks and 2 days and 14 weeks and 1 day. The test includes a scan which measures the amount of fluid at the back of baby’s neck and a blood test which measures the level of two hormones in your blood. The information is combined with your age to estimate the chance of your baby having Down’s, Edwards’ and Patau’s syndrome. This test is offered later in pregnancy between 14 weeks and 2 days and 20 weeks. The test measures four hormones in your blood to estimate the chance of your baby having Down’s syndrome. These tests do not tell us whether your baby definitely has Down’s, Edwards’ or Patau’s syndrome. They simply tell us whether you are at high chance (defined as a chance higher than 1 in 150) or low chance of having a baby with Down’s, Edwards’ or Patau’s syndrome. If the screening tests show that you are in the low chance group you will usually receive a letter informing you of this within two weeks of the test. If the screening test showed that you are in the high chance group, the options for management will be discussed with you. This will include the offer of a further test of an amniocentesis or Chorionic Villus Sampling (CVS) to find out if your baby has Down’s, Edwards’ or Patau’s syndrome or not (these are over 99% accurate). These tests both have a risk of miscarriage of 1%. NHS Choices – Screening for Down’s, Edwards’ and Patau’s syndrome. This is a fee paying test developed in the private sector to screen for Down’s, Edward’s and Patau’s syndrome. The test can be performed at any stage after 10 weeks of pregnancy for all singleton and twin pregnancies. The test looks for fetal DNA in the maternal circulation from a sample of mother’s blood. The screening test result shows if there is a low risk or high risk of your baby having Down’s, Edward’s or Patau’s syndrome. If the result showed a high risk result this should be confirmed by an invasive test such as amniocentesis. This test is not currently available under the NHS. However, Public Health England has recommended that NIPT should be offered to women with a higher risk result from screening as an optional extra test. This is due to start during 2018-19. A number of private clinic offer this service and the price varies between £350-£500. Our Trust offers the IONA NIPT screening test at a cost of £405 to women who book for antenatal care at Saint Mary’s Hospital. The test has a detection rate of 99% compared to the Combined Screening test, which has a detection rate of 85%. The results are usually available within 3-5 working days of the blood sample being taken. Pre- and post-test counselling is offered by the screening midwives. What should I pack for coming into hospital? Pregnancy and thrombosis - am I at risk? You are past your due date - what happens next?